Slow Roll Buffalo, a program of GObike Buffalo, announced the slate of rides for its fifth season during a Monday night party at the Broadway Market, which will host a ride on Oct. 7. Most rides – which run 10 to 12 miles in length – will take place on Monday nights, though weekend Pedal Parties and other special rides also are sprinkled into the mix. The family friendly rolls, presented by Independent Health, are open to riders of all skill levels and designed to knit communities more closely across Buffalo-Niagara. Rides start and end at the same point, which this year include parks, museums, community centers and craft breweries. Twenty-six Monday night rides focus on Buffalo neighborhoods and landmarks. 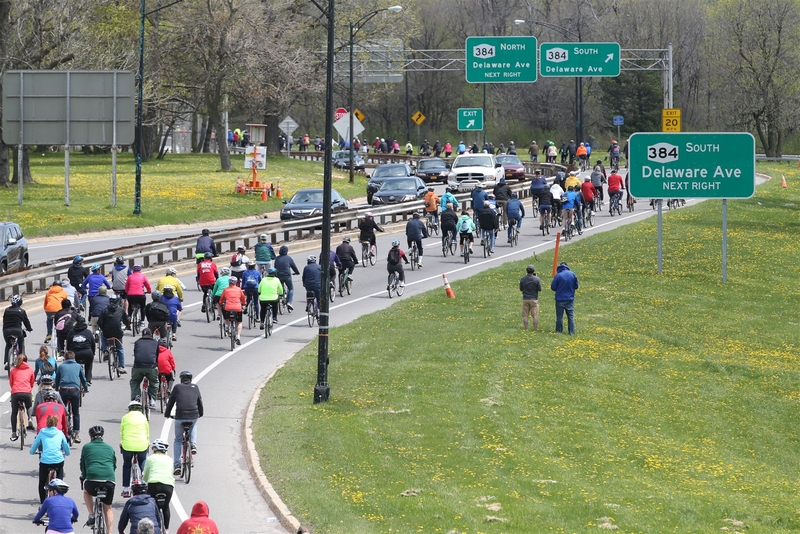 They will include a Restore Our Community Ride along the Kensington Expressway on May 13 and Parkway Revival Ride along the Scajaquada on May 20. The national Congress for the New Urbanism last week included both expressways on its “Freeways Without Futures” list. 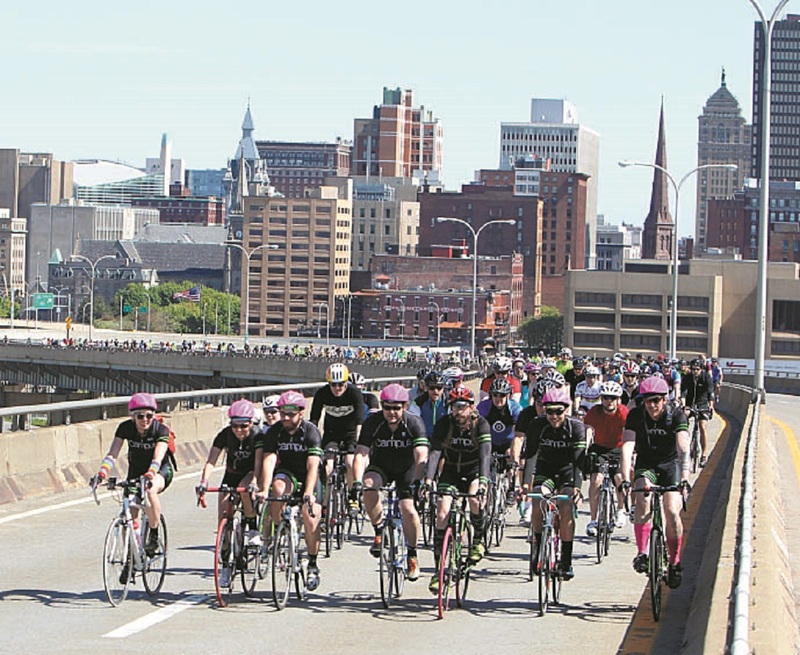 GObike Buffalo’s sixth annual SkyRide, a fundraiser for the nonprofit, will take place May 19 on a route that includes the Skyway and both expressways (visit skyridebuffalo.org to register). Clarence, Eden, Grand Island and the Tonawandas will be among suburban communities that host related rides this biking season. A Niagara Falls Bike Stampede, hosted by the African Heritage Food Co-op, will be held on May 11 to encourage participation in GObike Buffalo-led Niagara Falls Bicycle Master Plan. Ten new host sites also will be part of the new season, including Walden and Broderick parks. Returning favorites will include the Richardson Olmsted Campus, Silo City the Buffalo and Erie County Naval and Military Park. Monday night rides early in the season generally start at 6:30 p.m.; they transition to 6 p.m. as daylight starts to dwindle in the fall. Weekend times vary. All riders are encouraged to wear helmets and those under 14 are required by state law to wear them. Below is the schedule unveiled this week. Visit slowrollbuffalo.org for more information and to sign a waiver to ride.